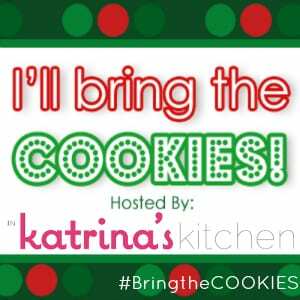 I am thrilled to be sharing a cookie with all of you fans of In Katrina’s Kitchen. This virtual cookie swap is right up my alley. Once December hits, I don my apron and pull out my stash of flour, sugar and butter and start my holiday baking. 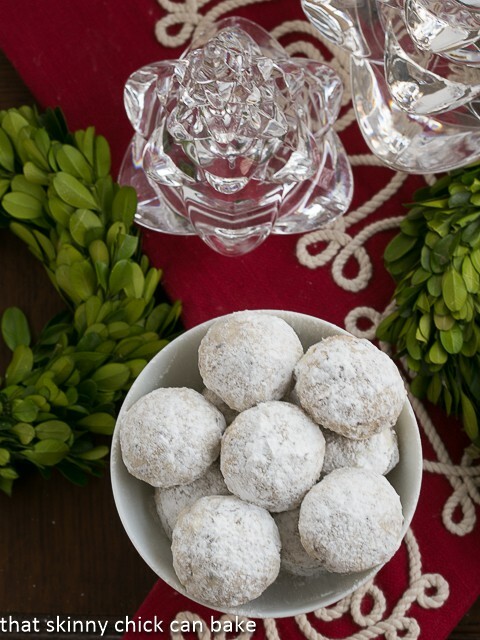 One of my favorite cookies is the noel nut ball…better known as the Mexican wedding cookie. However, when bringing a treat to a cookie exchange, it must be something extraordinary, so I gave these babies a little boost by adding chopped Heath bars to the batter. Doesn’t that sound incredible? They definitely were. 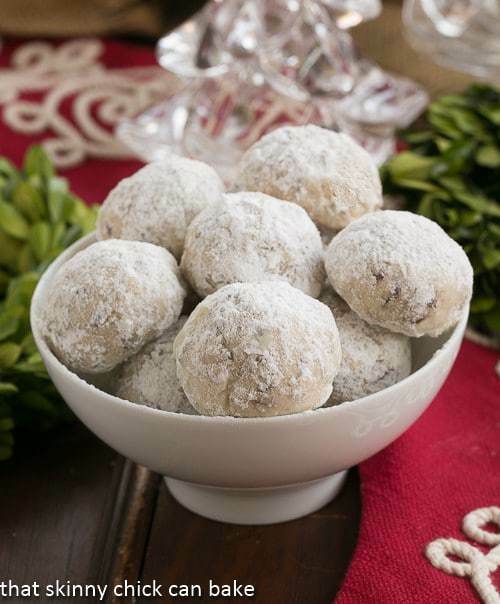 These nut balls are super simple to throw together…just cream together butter, sugar, water and vanilla. Add flour and salt, then mix in the finely chopped pecans and toffee bits. The dough is then rolled into balls, baked low and slow, then rolled in powdered sugar. They practically melt in your mouth. I’ve been known to chow down on these right from the freezer. If your nut balls aren’t perfect spheres after baking, with a few appendages from the melted toffee, just snip those melted bits off with a scissors before dusting with the sugar. Those little pieces are important to taste for quality control…well, maybe not, but it’s a good excuse for a little sample! 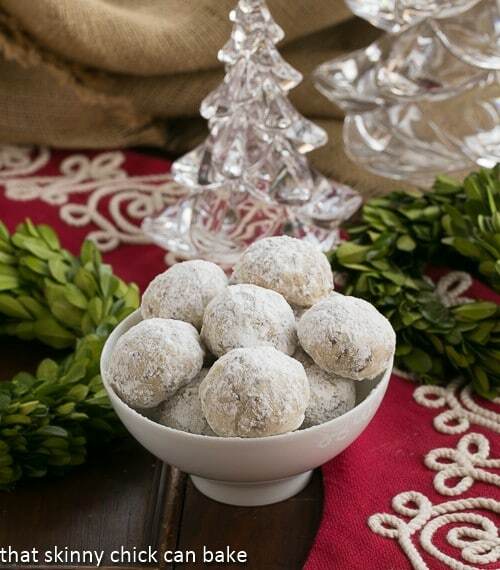 Toffee Noel Nut Balls (Mexican wedding cookies) made extraordinary by adding chopped Heath bars to the batter. A new twist on a classic holiday recipe. Preheat oven to 325ºF. Line baking pans with parchment and set aside. Cream butter, then add sugar, vanilla and water. Mix again. Stir flour and salt into mixture. Add pecans and toffee bits and mix thoroughly. Form tablespoon sized scoops of dough into balls. Bake for 18-20 minutes or till lightly browned. Roll in powdered sugar while warm. GUEST POST by That Skinny Chick Can Bake, recipe courtesy of my friend, Cyn. This post is part of our Third Annual I’ll Bring the COOKIES Virtual Blogger Cookie Swap. Be sure to check back here every day in December leading up to Christmas where some of the best bloggers will be sharing their favorite cookie recipe! You can also follow along Facebook, Twitter, Instagram, and Google+ with the hashtag #BringtheCOOKIES. Thank you to OXO for being our exclusive #BringtheCOOKIES sponsor. Be sure to visit Liz’s blog, That Skinny Chick Can Bake to enter a sweet OXO Baking Prize Pack. DYING for a couple of these right now. So fun! Same here! I love these cookies every year around Christmastime. How exciting to find liz here! 😀 Ohhh they look so delicious!!! They look so pretty and festive. I didn’t know we can make them in less than one hour! Delicious cookies in an hour? I’m sold too!! Thanks so much for having me here today, Katrina!!! I’m LOVING all the cookies in this series!!! Thank YOU, Liz for bringing the cookies! They look fabulous. Do-able, delicious and elegant – now that is one little happy Christmas cookie gift! Throw a Heath bar in anything and it’s instantly better! Love these cookies Liz and Katrina! It would be worth the postage to get Heath bars sent from the states to make these! Trying to round up the ingredients to make these as we all love Mexican Wedding Cookies, so the addition of toffee bits and pecan nuts is sure to please. Biggest problem here in Oz is getting just plain old toffees or toffee bars, you’d think I was asking for nuggets of gold! I shall not give up….. I am presuming the flour is Plain or All Purpose as you refer to it?